I just purchased a sd850is. I like the camera but am concerned about the curvature of lines in my photos. In both attached photos you can see distortion of straight lines. 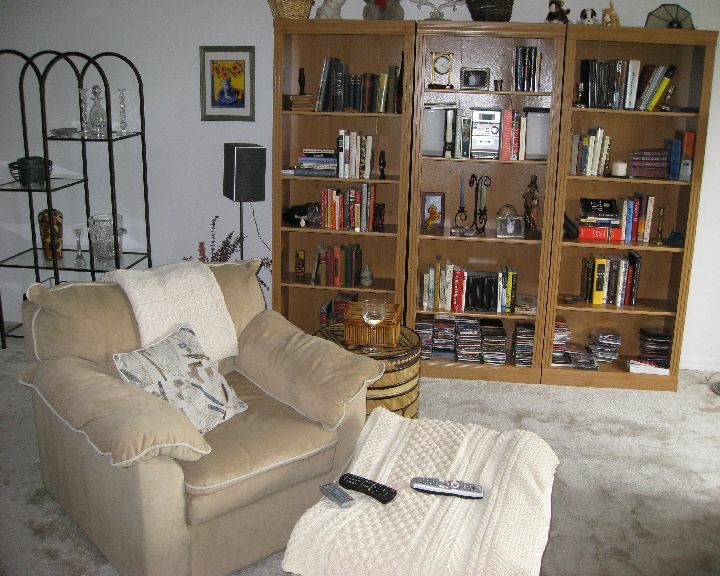 The top of the bookshelves are bent and the glass shelves on the left look tilted. In the othe photo the ceiling line is also curved and pictues on the wall look skewed. I'm new to cameras but this does't seem right for this quality of a camera. Any advice would be appreciated. Thanks in advace. This type of distortion and bending in normal for most point and shoot cameras (called barrell distortion or pin cushion distortion) when the camera's zoom is set all the way in or all the way out - look it up on the web for more info. Most average camera owners don't really realize that this can occur because they may not be taking the kind of pictures that actually reveal it. For instance, if you use the zoom lens zoomed out about mid-way the image will not have the kind of bending you're seeing. I have the same problem with my S3IS. You can correct this distortion with software. I am sorry, but I think a camera that does not have barrel distortion will be very, very expensive. I took many shots of a special test-board where I painted rectangles on it. I took about 70-75 pictures as I slowly zoomed in from 36mm to 432mm (12x zoom). I corrected the barrel distortion (PS Elements or the trial version of the MediaChance software), then looked at the focal length for each picture. I developed a "rule of thumb" so I can look at the focal length and know exactly how much barrel distortion to remove in any future pictures. Vertical lines (like columns on government buildings) will have bad curves when they are close to the edge of the picture. If you step back, the columns won't be so close to the edge of the picture, and they will be straighter. Nature pictures won't show the distortion as much. For my camera, the distortion stopped happening after I zoomed in just a little bit. I hope yours is like this.